Charles Burnett’s The Glass Shield is as potent today as when it was released 25 years ago. This underappreciated and underseen gem never got the acclaim of Burnett’s masterpiece, Killer of Sheep—deemed an “essential” film by the National Society of Film Critics. Nor did it get rapturous reviews that greeted Burnett’s 1990 film, To Sleep with Anger. But this shrewd, cynical drama about racism —“based on a shocking true story”—is worthwhile. The opening credit sequence features comic book panels of cops doing good—as if Burnett is emphasizing the myth of law enforcers. 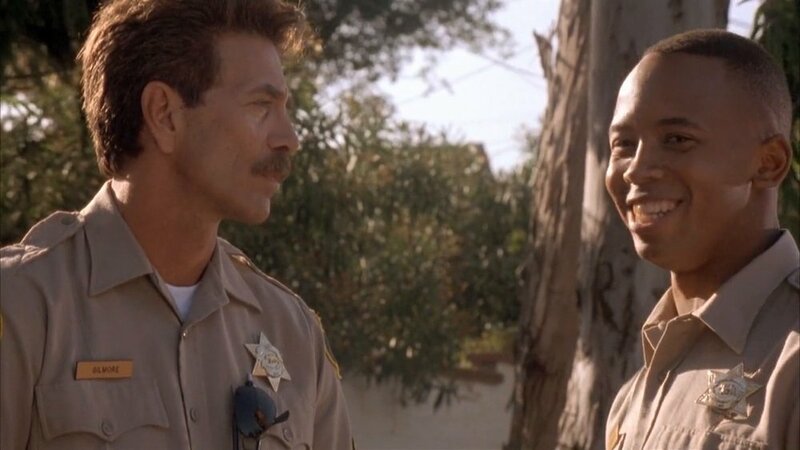 Deputy J.J. Johnson (Michael Boatman), fresh out of the Academy, is told he is “about to make history” as the first African American man on an all-white police force. And as he parks his car at his new job, he also suffers the first of many microaggressions. His colleagues are a sea of white men with one exception: Deputy Deborah Fields (Lori Petty), the first woman on the squad. These two outsiders, who don’t fit in, slowly bond, getting closer as they discover the depths of corruption inside their department. Burnett’s low-budget film is not big on flashy set pieces or action scenes—though there are one or two intense moments. Mostly, The Glass Shield is a character-driven story full of intrigue and deceit. The plot kicks into gear when J.J. and his colleague, Deputy Bono (Don Harvey), arrest Teddy Woods (Ice Cube) at a gas station. Teddy had a gun in his car, and—according to the police—it was the same one used to kill the wife of Mr. Greenspan (Elliott Gould) in a recent crime also being investigated. However, Deborah, who was the second officer on the Greenspan scene, finds flaws in how the victim could have been killed in the way Greenspan recounted. The gun is linked to Teddy in an effort to close that case. Of course, there is more to the story. What transpires are secret investigations and set-ups that depict how J.J. and Deborah confront the racism, sexism, and ugly truths that ultimately put their lives and careers at risk. Moreover, a series of courtroom scenes show how justice is meted in the Woods case. Burnett deliberately keeps the film low-key, and that works in its favor. He embraces his low-budget aesthetic, shooting much of the film in close-up, like a TV show. Scenes of African Americans filmed in silhouette are especially striking. Likewise, the use of blue and other colored filters as well as poignant jazz music on the soundtrack help create atmosphere and generate emotion. Boatman makes J.J.’s getting of wisdom credible. He is an eager beaver in the film’s early scenes, smiling happily, innocently, but his expressions change as he uncovers the web of lies and deceit around him. When a fellow officer tells him early on to trust no one, the implications of that statement resonate later. He becomes harder, angrier, and more self-loathing, culminating in a scene of him physically attacking a fellow officer. He all too slowly realizes how his ambitions and “going along to get along” actually land him in trouble. The film also effectively portrays his relationship with his girlfriend Barbara (Victoria Dillard), who knows J.J. better than he knows himself. ﻿The Glass Shield thoughtfully examines how African Americans are treated by the police, from routine traffic stops to being scapegoated for crimes. Alas, the film’s abrupt and cynical ending will leave viewers as unsettled as the characters—and that is a good thing. The social commentary here stings and it is why Burnett’s film remains timely and topical.